We talked about hints for working in the kitchen. Now let’s talk about hints for the rest of the house. trips on a rug and breaks a hip? You would feel awful.” She immediately collected her area carpets and put them in the laundry to give away. Lighting!!! Good lighting will help. Keys. If you have a mailbox that requires a key, a piece of adhesive tape will make it easier to identify. Everything in its place. I mentioned in another post, putting everything back in place after use will make life easier. You don’t have to search for the scissors, keys, or magnifying glass. A hand – held magnifying glass with a built in light will help more than a regular magnifier. Telephones. Large button speakerphones and talking caller – ID will help. The hands free feature of the speakerphone allows Millie to check her calendar while on the phone. Voice activated dialing speakerphone. 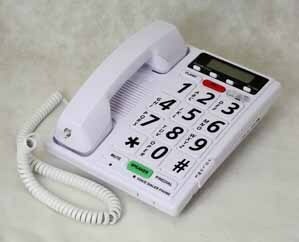 Millie didn’t have one, but this device allows the caller to speak the name of the person they wish to call. The phone in the LS&S catalog holds 17 names. A talking keypad gives verbal feedback of numbers pushed.